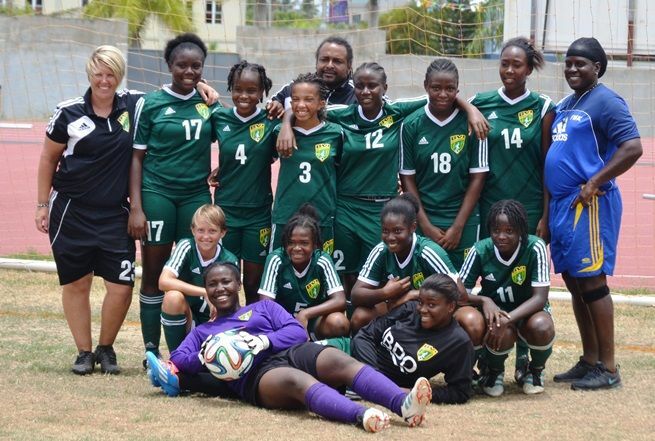 Monday 27th July, 2014 -the BVI Football Association U15 Girls took on the U15 Girls team from the St Thomas-based Laraza F.C. for a one day Football Festival, Sunday, on the A.O. Shirley Ground. Up first, the U15 Girls, who have been training under the watchful gaze of Coach Kate Rowsdon in preparation for the CONCACAF U15 Girls Tournament being hosted by the Cayman Islands in August, played their St Thomas counterparts and came out with an impressive 5-0 victory. After racing into a 4-0 half time lead through a penalty from Davian Williams, a brace from Morgan Creque and a first time long range shot by Lilly Pierce. Keithriece Smith rounded out the scoring in a much more even second half when the BVI Girls had to contend with the wind in their faces and a change of strategy. “In the first half we took advantage of Laraza playing a deep back line, with us pushing the ball forward quickly, which made sure we had the ball in their half a lot. In the second half I wanted the Girls to take a little more time, relax on the ball, take a touch and look for a pass to feet. It was a struggle at first, but the Girls tried to apply it and I’m pleased with the way they stuck to the plan,” stated Coach Kate. It was just the second competitive outing for the Girls as a team and Coach Kate was also aware that the Girls will need to learn how to play in Tournaments and play in a more controlled manner for the entire game. “Like a lot of games, the first few minutes were erratic and being only their second game, they still had a touch of the jitters,” commented Coach Kate. “In the Tournament we need to get on the pitch and be calm, we have to understand the speed of play, control the speed of play and bring the ball down and play it how we want to,” she said. Overall Coach Kate was very pleased with the team and learnt a lot during the game, which was a great performance, great result and highlighted how, with a lot of hard work and dedication the Girls can become a talented group of players for years to come. The final squad for the CONCACAF Tournament in Cayman will be leaving Monday August 4, 2014 and according to the official schedule on www.concacaf.com will face the hosts on Wednesday August 6th at 7.30pm. On Friday August 8, 2014 the team faces Curacao also at 7.30pm and then concludes group play with a game against the Bahamas on Sunday 10th August at 5.30pm. The Final is scheduled for Sunday 17th August.